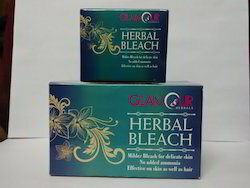 Leading Manufacturer of glamour gold bleach cream and glamour herbal bleach cream from Mumbai. Packaging Size 25 g,50 g,250 g.
Glamour Gold Bleach Cream: This bleach cream is enriched with efffective ingredients which add golden glowto the skin. Humactants from cream base prevent any irritation associated with bleaching. ,bleach is specially formulated to suit even the most delicate skin. This ammonia free formula, bleaches skin effectively, giving fairer look. Use twice a month, for best result.